Published: July 23, 2018 at 01:35 p.m. Updated: July 23, 2018 at 03:05 p.m. I love Andy Reid. One of the top coaches in NFL history. Feel like he's the Marty Schottenheimer of this generation -- a guy who could take over just about any team in the NFL and win. But that shouldn't take away from the fact that he has had some damn good players. In compiling this team, I'm putting it together for a one-year run -- not judging somebody's entire career. And you can probably tell where that statement is leading us. Note 1: Yes, I cheated (per usual) and selected 12 defenders. That's because Reid is a genius who makes the most of his talent and isn't so rigid that he can't move from a 4-3 in Philly to a 3-4 in K.C. That's why he's successful. Unlike offensive coordinators who think that their precious unit can't handle a tight end, so you TRADE AWAY GREG OLSEN. ARE YOU LISTENING, MIKE MARTZ? Long story short, I've supplied personnel for a 4-3 and a 3-4. Note 2: The time each player spent under Reid is listed parenthetically. Donovan McNabb would be your answer if you based this on the totality of his career under Reid. No question. I am not disrespecting McNabb. But for one season? Give me Vick. The 2010 campaign -- when he threw 21 touchdowns with just six interceptions in 12 games while adding 676 rushing touchdowns and nine more scores -- was one of my favorite quarterback seasons ever. A perennial all-purpose star under Reid, Westbrook had his best season in 2007, when he amassed 2,104 total yards and 12 touchdowns. And it could have been more, had he not taken a knee at the end of a win against the Cowboys -- a move that secured the dub but deprived fantasy dorks of six points. He was already a great running back before Reid's arrival, but his best season occurred during Reid's first year in Kansas City. Charles racked up 1,980 yards and 19 total touchdowns. Although I'm almost positive the majority of those TDs came in one game at Oakland. T.O. is one of the best receivers ever. I don't care if he no-shows the Hall of Fame, does sit-ups in his driveway or whatever. The dude could flat-out ball. And I'm going to be real with you here: Rushing back from a broken leg to play in the Super Bowl doesn't get enough deference and respect. 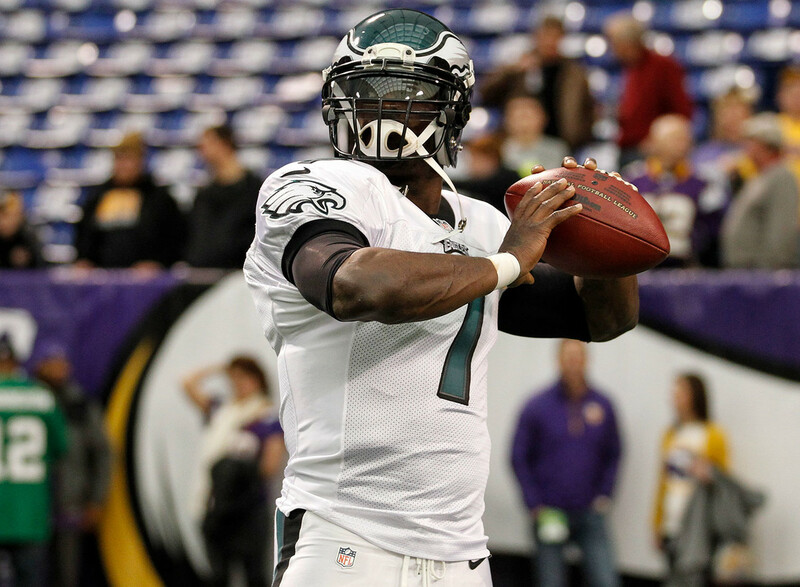 If you need justification here, just Google "Michael Vick and DeSean Jackson." That play that comes up should do enough convincing. The 88-yard touchdown was the product of the Redskins talking [stuff] about Vick all week. What an amazing moment. One of the best tight ends in the game, no doubt. Fresh off a season where he set a career high with eight touchdowns. And he was nominated by Nickelodeon for the "King of Swag" award this year. Obviously, this was part of Reid's influence. Thomas played 11 seasons for the Eagles, earning three Pro Bowl nods and one second-team All-Pro along the way. He was a member of the Eagles' 75th anniversary team. A current member of the Eagles, Peters has been selected to nine Pro Bowls. The biggest bummer is, he missed last year's Super Bowl run with an ACL injury. A first-round pick of the Eagles in the pre-Reid days, he was a solid NFL player for a long time. He bounced around the line but eventually found a home at right guard -- and earned a Pro Bowl bid in 2002. Andrews was a two-time Pro Bowler -- and a first-team All-Pro in 2006. He made the Eagles' 75th anniversary team. Kelce, who has made two Pro Bowls in his ongoing career, started all 16 games as a rookie under Reid in 2011. And he'll provide entertainment at this imaginary team's faux victory parade. Thought to be ill-suited for Bill Parcells' 3-4 defense with the Jets, the former Defensive Rookie of the Year was traded to Philly for a second- and fifth-round pick. The move paid great dividends to the Eagles. Douglas ranks fourth on the Eagles' all-time sack list (54.5), behind Reggie White, Trent Cole and Clyde Simmons. Speaking of sack leaders, as you saw above, Cole ranks second in Eagles history, behind only the legendary Reggie White. He also made two Pro Bowls during his time under Reid. The Eagles selected Simon with the sixth overall pick in the 2000 NFL Draft, and he became an immediate monster in the middle, helping the team hit four consecutive NFC Championship Games (and a Super Bowl). Poe was in his second season in Kansas City when Reid arrived, and he proceeded to make consecutive Pro Bowls. Poe remained a presence for the Chiefs until he bounced for Atlanta in 2017. Houston is one of the best in the game, and he nearly broke Michael Strahan's single-season sack record in 2014, when he had 22. Houston piled up four sacks in the season finale vs. the Chargers to get close, but apparently Philip Rivers wouldn't do him a Brett Favre-like solid in the end. Hali's 12-year run with the Chiefs came to an end this offseason. He played both defensive end and outside linebacker in Kansas City, where he racked up 89.5 sacks. Trotter had three separate stints in Philly, and that's where he enjoyed his most success. During his 11-year career, Trotter earned four Pro Bowl nominations -- all under Reid. Johnson was part of a spectacular LB draft class that included DeMarcus Ware, Shawne Merriman and Thomas Davis (all of them were selected between pick Nos. 11 and 15). He has earned four Pro Bowl nods during a highly productive career. Samuel played for both Bill Belichick and Reid -- and was one of the best CBs of his era. He came to Philadelphia in 2008 and led the league in picks the following year -- the second time he'd accomplished that feat in the NFL. Peters was traded to the Los Angeles Rams in the offseason, but he is quickly becoming one of the best players in the game -- yes, even with the explosive demeanor. A player some might consider Reid's best player in Kansas City. Berry is coming off a season-ending Achilles injury, the third major medical issue of his career. Regardless, he is still one of the best to ever play his position. Yes, you might only remember him from his draft trollage in Dallas this year. But he was one of the most effective NFL kickers in his day. Dude was automatic. He's a 13-year veteran with the Chiefs, being a holdover from a number of coaches. He's made two Pro Bowls during his career, including one under Reid in 2016. Let's use Hill as our special team's ace and third receiver. He made the Pro Bowl as a returner two years ago and as a wideout last year.